To meet the needs of a growing community and to take advantage of advances in security technology, Wake County elected to build an 11-story, 577,000-square-foot Justice Center in downtown Raleigh, NC. 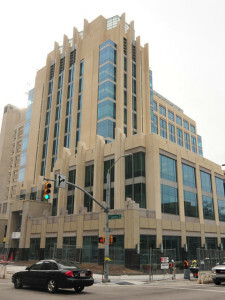 Due to the location, environmental factors, subsurface conditions, and several unexpected issues during construction, the new Justice Center project created several unique challenges for the Wake County Facilities, Design and Construction Department. Terracon worked with the County and Construction Manager (CM) and Structural Engineer (SE) to help navigate through these challenges from the design phase through construction. The project site was located in the heart of downtown. Standing in the way of a successful start to the project was a five-story building that covered a large portion of the proposed footprint of the new building. The county needed to know the subsurface conditions, but could not wait until the building was demolished to gather geotechnical information. Terracon used its extensive knowledge of the downtown geology, paired with select soil borings, to provide preliminary recommendations to the design team so that the design phase of the project could proceed. The existing building was also an environmental challenge due to concerns with potentially hazardous materials in the structure. A team of environmental professionals were quickly mobilized to survey the building for hazardous materials that would need to be mitigated during the demolition process. Terracon then assisted the County and their demolition contractor in developing a hazardous materials abatement plan that enabled the demolition to be completed safely and on time. Once the building was demolished, a thorough subsurface investigation was needed to assess the residual soils derived from the in-place weathering of the parent rock. The gradual transition from soil to rock creates a zone locally-termed as Partially Weathered Rock (PWR). PWR occurs over variable thicknesses and the depth of the PWR can be erratic over relatively short distances. Augured, cast-in-place piles bearing in the PWR were recommended by Terracon over other deep foundation systems to allow flexibility in both the installation depth and location of the foundation elements. As the project progressed toward construction, preconstruction planning between the CM and Terracon identified a potential problem. If the piles installed to support construction cranes were not long enough due to the depth of the PWR, they would not provide sufficient uplift resistance to support the crane. Terracon worked with the contractor to develop a back-up plan that used rock anchors if required for the needed uplift resistance. With a contingency plan in-place, the crane mat was pre-designed to accommodate the rock anchors. Preconstruction planning also allowed the team to recognize that drilled piers associated with the former structure and abandoned in-place could present obstructions during the new pile installation. Terracon worked with the CM and SE to develop an approach for appropriately relocating a pile when this situation occurred. Issues were resolved within 30 minutes. As the project progressed through the construction phases, additional challenges arose, and Terracon was called upon to provide specialized inspection and consulting. During installation operations for the precast concrete panels, a panel that had been installed fell four stories. Fortunately, the panel landed in an unoccupied utility vault without harm to anyone. The incident raised serious concerns about the existing panels as well as the integrity of yet to be fabricated panels. Terracon mobilized a team of experienced inspection personnel on short notice to inspect every panel that had already been installed. Then they provided inspections while engineered field repairs were completed on suspect panels and inspected remaining panels at the plant during fabrication. This quick response allowed the project team to continue without impacting the overall schedule. Another challenge arose following a significant wind event. The CM called on Terracon to assist after suspected wind damage to one of the tower cranes. Terracon staff performed non-destructive testing using the magnetic particle test method on the crane turntable. Testing was delivered on extremely short notice, during a weekend, and found signs of damage in the welds. Our ability to respond quickly allowed the CM to resolve the issue immediately. As a valued member of the project team, Terracon was able to provide a wide array of technical resources to assist with environmental, geotechnical, and construction needs. Our professionals were able to offer insight and expertise to resolve the challenges during the project. Because of the team’s ability to anticipate the unexpected and formulate quick responses, the project moved significantly ahead of schedule and is expected to finish earlier than anticipated and under budget.